One America Plaza is the tallest building in San Diego, California and a prominent fixture in San Diego's skyline. Located in the waterfront district of Downtown San Diego, One America Plaza is a thirty-four story, obelisk-shaped tower standing 500 feet tall, designed by architects Helmut Jahn of Murphy/Jahn Architects and Krommenhoek/McKeown & Associates. The top of the building bears a striking resemblance to the end of a Phillips-head screwdriver. Symphony Towers is a high-rise building in San Diego, California, and is the city's second tallest skyscraper. 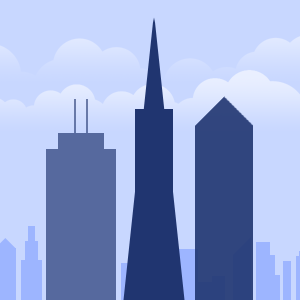 The tallest in San Diego is One America Plaza of 500 feet while Symphony Towers is 499 feet. Designed by Skidmore, Owings and Merrill, Symphony Towers is widely seen as one of Downtown's premier locations. 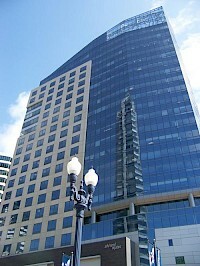 The building is Located on B Street in the Financial District. 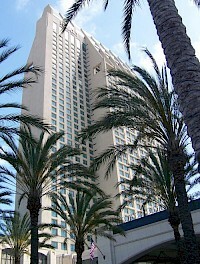 Manchester Grand Hyatt Hotel is a high-rise building in San Diego composed of two towers. The towers are the third and seventh tallest buildings in the city. It is the tallest building on the waterfront on the West Coast and with over 1600 rooms, it is Southern California's largest hotel. Because of its proximity to the waterfront, as well as its amenities, the Manchester Grand Hyatt is referred to as a spa and resort. It was developed and is owned by Doug Manchester. 880 West Broadway is a 470-foot-tall (140 m) building under construction located on the north-eastern corner of Broadway and Pacific Highway. 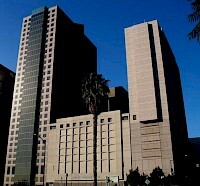 Adjacent to Union Station, 880 West Broadway will be a prominent structure in the skyline of San Diego once completed. Construction began in mid-2008, and the project is expected to be complete in two and half years. 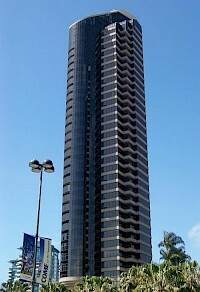 Emerald Plaza is the fifth tallest building in San Diego, California and is a prominent fixture in San Diego's skyline. Tied with The Pinnacle Museum Tower, it has a height of 450 ft (137 m). Located in the Core district of Downtown San Diego, Emerald Plaza is a 30-story building with a hexagon roof, designed by architects C.W. Kim Architects & Planners. Emerald Plaza finished construction in 1990. Harbor Club Condominiums is a high-rise residential building in San Diego, California composed of two towers of equal height. The 41-story towers have a height of 424 feet (129 m) and are a prominent fixture in San Diego's skyline. Located in the Marina district of Downtown San Diego, Harbor Club was designed by architects BPA Architecture Planning Interiors. The condos are located near the San Diego Convention Center and Petco Park. 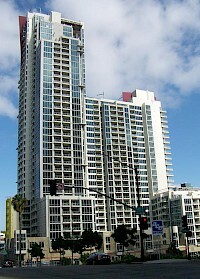 Vantage Pointe Condominium is a high-rise building in San Diego. Bounded by Eighth and Ninth Avenues, and A and B Streets, construction began in 2006 and ended in 2008. It is Downtown San Diego's largest condominium building. In 2009 the building's owners announced they will refund all the purchase deposits made for its units. 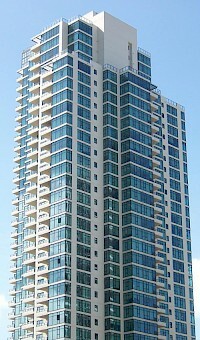 The Grande at Santa Fe Place is a high-rise residential building in San Diego, California composed of two towers of equal height. The 39-story towers have a height of 420 feet (128 m) and are a prominent fixture in San Diego's skyline. 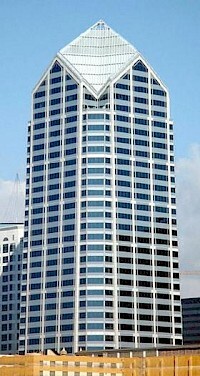 Located in the Core district of Downtown San Diego, The Grande at Santa Fe Place was designed by the architect firm Perkins & Company Architecture and Urban Design Inc.
Advanced Equities Plaza is the 13th tallest building in San Diego, California and is a prominent fixture in San Diego's skyline. Tied with The Pinnacle Museum Tower, it has a height of 412 ft (126 m). Located in the Marina district of Downtown San Diego, Advanced Equities Plaza is a 23-story building that utilizes the postmodern architectural style and was designed by the architect firm Carrier Johnson Architects. The Omni San Diego Hotel is a four-diamond high-rise luxury hotel and condominium tower in San Diego, California. It is owned and operated by Omni Hotels & Resorts. 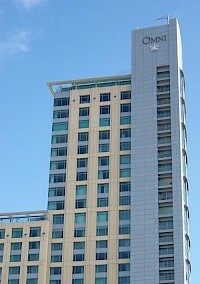 Built in 2004 at a cost of $124 million, the 32-story, 511-room Omni San Diego is located across the street from the San Diego Convention Center and connected via sky bridge to Petco Park. The hotel has over 20,000 square feet of meeting space in addition to a 9,750 square foot ballroom.